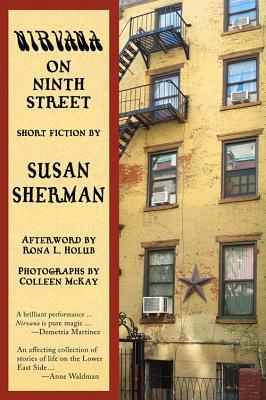 Set in the 1960s and 70s, Nirvana on Ninth Street is loosely based on residents who lived on and near Ninth Street between Avenues B and C in Manhattan, in what is now known as the East Village, during an extraordinary period when the area was a mecca of political radicalism and avant-garde poetry, music, and art. Rachel, a wholly fictitious character, ties the vignettes together. She is a woman who lives largely in a world of her own creation, remembering people from her past who live once again through her imagination. This book is the theater of the absurd, a comedy of errors, and brutal realism all rolled into one delightful, poignant, and sometimes tragic fantasy. Susan Sherman is a poet, a playwright, an essayist, an editor, and a cofounder of IKON magazine who also opened IKONbooks, a bookstore which served as a cultural and movement center. She has had 12 plays produced off-off-Broadway, has published seven collections of poetry, and is the author of the memoir America’s Child: A Woman’s Journey through the Radical Sixties. Her work has been published in many periodicals and anthologies, including the American Poetry Review and the Nation. Rona L. Holub is a historian, a teacher, and the director of the Women’s History Graduate Program at Sarah Lawrence College. She specializes in women’s history, urban/immigrant history, especially that of New York City. She serves on the board of All Out Arts, Fighting Prejudice Through the Arts, and is a licensed New York City Tour Guide. Colleen McKay, is a photographer whose work has been featured on book covers and exhibited in such venues as the Henry Street Playhouse. She is the former staff photographer for IKON magazine. They all live in New York City.